Tsenhor was born about 550 bce in the city of Thebes (Karnak). She died some sixty years later, having lived through the reigns of Amasis II, Psamtik III, Cambyses II, Darius I and perhaps even Psamtik IV. By carefully retracing the events of her life as they are recorded in papyri now kept in museums in London, Paris, Turin, and Vienna, the author creates the image of a proud and independent businesswoman who made her own decisions in life. If Tsenhor were alive today she would be wearing jeans, drive a pick-up, and enjoy a beer with the boys. She clearly was her own boss, and one assumes that this happened with the full support of her second husband Psenese, who fathered two of her children. She married him when she was in her mid-thirties. Like her father and husband, Tsenhor could be hired to bring offerings to the dead in the necropolis on the west bank of the Nile. For a fee of course, and that is how her family acquired high-quality farm land on more than one occasion. But Tsenhor also did other business on her own, such as buying a slave and co-financing the reconstruction of a house that she owned together with Psenese. She seems in many ways to have been a liberated woman, some 2,500 years before the concept was invented. 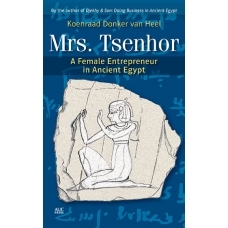 Embedded in the history of the first Persian occupation of Egypt, and using many sources dealing with ordinary women from the Old Kingdom up to and including the Coptic era, this book aims to forever change the general view on women in ancient Egypt, which is far too often based on the lives of Nefertiti, Hatshepsut, and Cleopatra.